NEW HAVEN, Conn. — The sound of trumpets and nearly 600 applauding guests greeted Peter Salovey and his wife, Marta Elisa Moret, as they arrived at the Yale University Commons on Saturday night for a sit-down celebratory dinner. 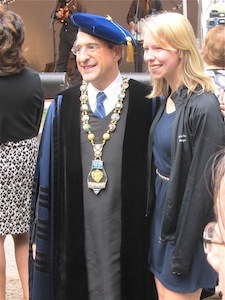 The following afternoon Salovey, who is 55 years old and has spent his entire career at America’s third oldest university, was formally inaugurated as Yale’s 23rd president in a ceremony of music, oratory, and pageantry held at Woolsey Hall, which seats nearly 3,000 people, and was packed. Salovey and his wife are known in New Haven, and across American academia, as genuinely down to earth, self-effacing, approachable, and modest. Salovey’s career at Yale, where he received his graduate degrees, and where he began teaching in 1986, is distinguished by the close personal rapport he built with students, and with his faculty and administrative peers. Neither he nor his wife is especially devoted to making big public statements about their succession to the helm of a great American institution. Nor could the two have anticipated that the inaugural weekend here, a study in the best of what America is, would fall on the same days that, 300 miles south, political Washington, D.C. would be engulfed by a dangerous political crisis that reflected our very worst. The juxtaposition, while painful, was illustrative. As professor, department chairman, dean, and provost, Salovey contributed to the emergence of Yale University as a citadel of diversity, scholarship, and citizenship. Yale’s administrators were led during the past two decades by former President Richard Levin, an economist, who charged his top aides with rebuilding the New Haven campus, working with the city to revitalize downtown and nearby neighborhoods, establishing international programs and ties to overseas universities, and providing more scholarships and financial aid for talented but less privileged students. Yale accomplished all this and more while also adhering to its history of excellence in scholarship. The school attracted almost 30,000 applications last year and is tougher than ever to get into. Those accepted have the highest standardized test scores of any college in the country. On Saturday night, during a driving dance party attended by well over 1,000 beautifully dressed undergraduates, the swirl of the university’s handiwork was in full view. Yale’s students are straight, gay, white, black, Latino, Asian, African,Christian, Jewish, Islamic, Budhist, and Hindu. They attend Yale to learn with their peers, the keenest minds of their generation. They leave here with a formidable liberal arts education and the knowledge that discipline, hard work, and smarts are only three ingredients in the formula for a successful life of service. Yale, in sum, embodies the best traditions and ambitions of the American experience. That is what Salovey chose to honor during his inaugural weekend. Yale students responded at every turn. On Sunday, during the block party, they lined up to have their picture taken with him. 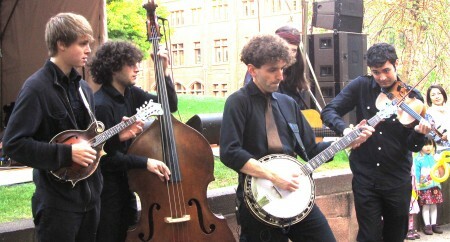 Yale’s new president also is an accomplished bluegrass bass player. When Salovey arrived at the Saturday night party to play a short set with his band, the Professors of Bluegrass, students greeted him with the rhythmic chant of Sal-O-Vey! Sal-O-Vey! Sal-O-Vey!